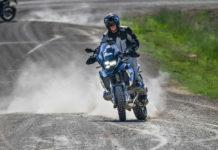 Home Reviews BMW First Impressions of the 2019 BMW F 750 / 850 GS. Standing position, legs open, knees bent, elbows bent, vision correct! I make sure to follow the rules and give myself a fighting chance. Second gear selected, ready to give it full throttle. The moment of truth comes as I dip the 21 inch front wheel into the sand. I proceed cautiously until I get a feel for the nature of the sand, dabbing a foot here and there from the standing position. Time go give full throttle as the sand starts swallowing the wheels. The cross plane twin cylinder engine bursts into life and propels me to the crest of the first dune. Over the summit I look forward to the downhill in order to gather proper momentum now that I have a feel for my surrounds. Cresting the second dune I start laughing in my helmet, embarrassed that I had underestimated this brilliant new machine which I straddled just a few hours earlier. I stop at the second crest for a photo opportunity and give myself a breather after quite the wrestling match. I am surrounded by a sea of dunes as I cut the engine. The late afternoon sun winks in amber and all I can hear is my elevated breathing. This is one of those moments to remember. 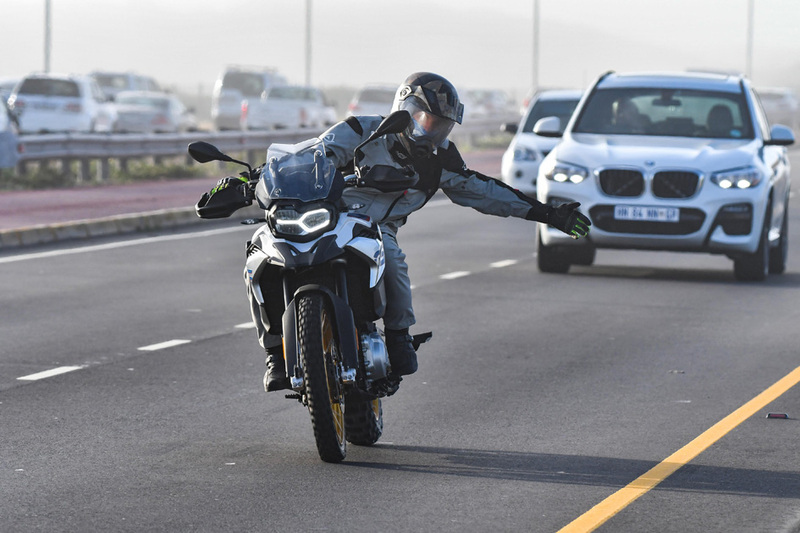 The only other activity I can detect is Rob Till, a brilliant photographer hired by BMW Motorrad rushing in to capture the moment. As I collect my thoughts, I cannot help but admire the courage BMW showed by selecting this venue. 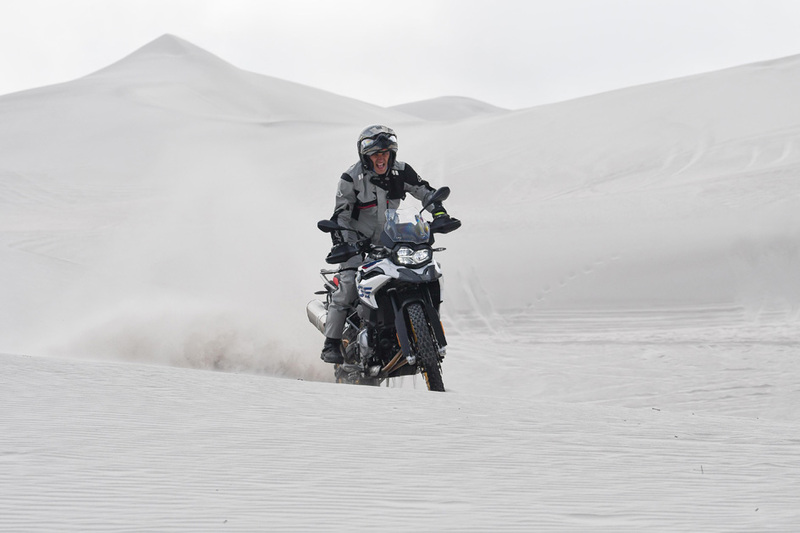 Sand riding is one of the ultimate tests for any adventure machine and greatest fear for most adventure riders, at least for those big enough to admit it. 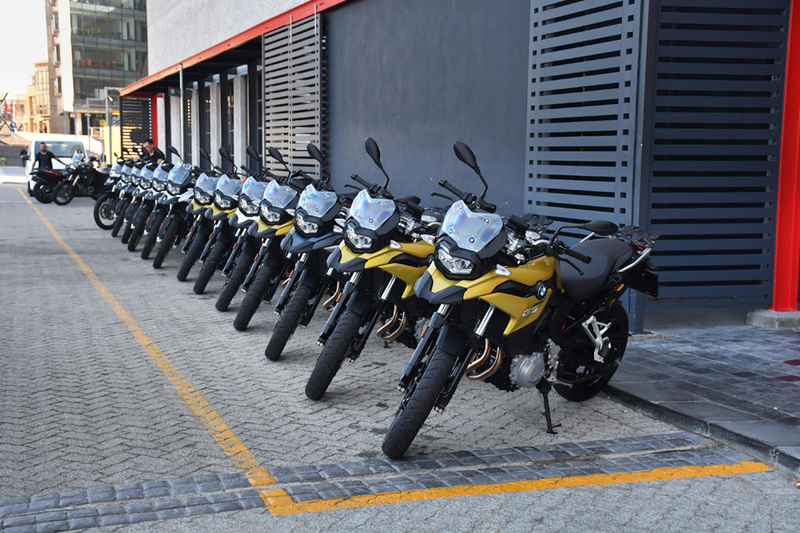 Thinking back to earlier in the day when I first saw the row of F 850 GS’s parked in front of the hip Radisson Red Hotel on the V&A Waterfront. I should have known BMW was serious about this one when noticing the fresh mix of knobby tyres on each press bike. 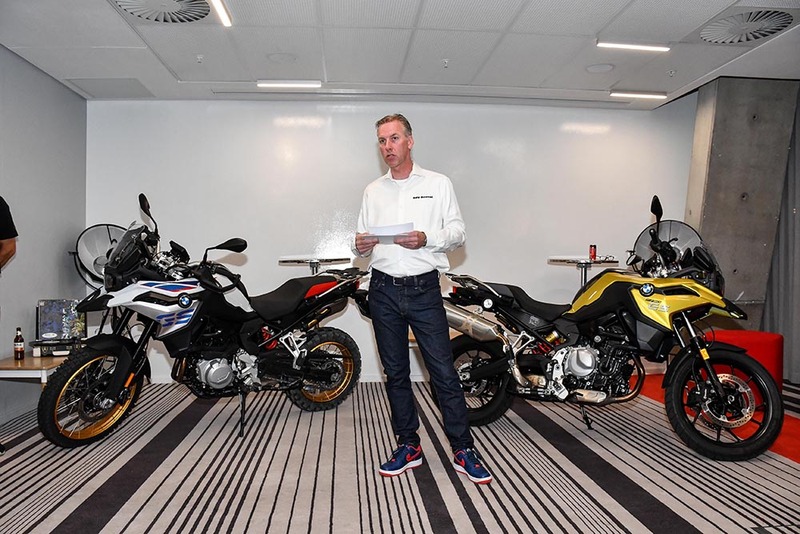 I later complimented Edgar Kleinbergen, General Manager of BMW Motorrad SA, for allowing these bikes into their natural habitat with the right footwear. 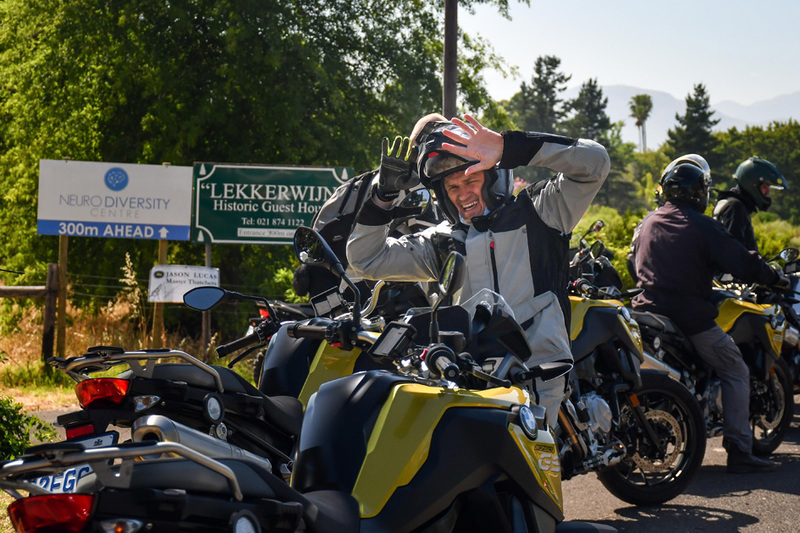 I have previously battled against Edgar at the 2018 Sabie GS Challenge, and he is a very talented Adventure rider. His enthusiasm, energy and love for the sport does not go unnoticed. Dutch by birth, Edgar has been in SA since early last year. He uses every free hour for exploring our vast expanses, together with a network of local riders. Don’t look now, but Edgar is truly falling in love with our Country and its endless possibilities. 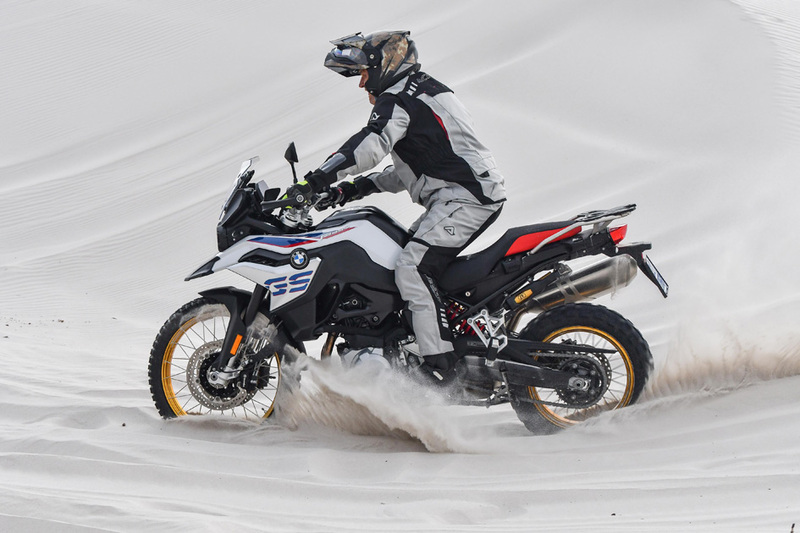 The new F 850 GS comes at a very crucial time in the history of the middleweight Adventure segment. 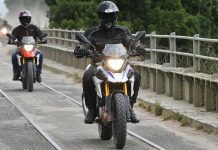 It has been a full decade since I was fortunate enough to attend the world launch of the inaugural F 800 GS in the Algarve Province of Portugal. Since then, this segment has become hotly contested with no clear leader. BMW gradually lost its stranglehold as fans had to put on the patience-cap year after year. After freshening up, we socialised a bit before the early evening press conference. 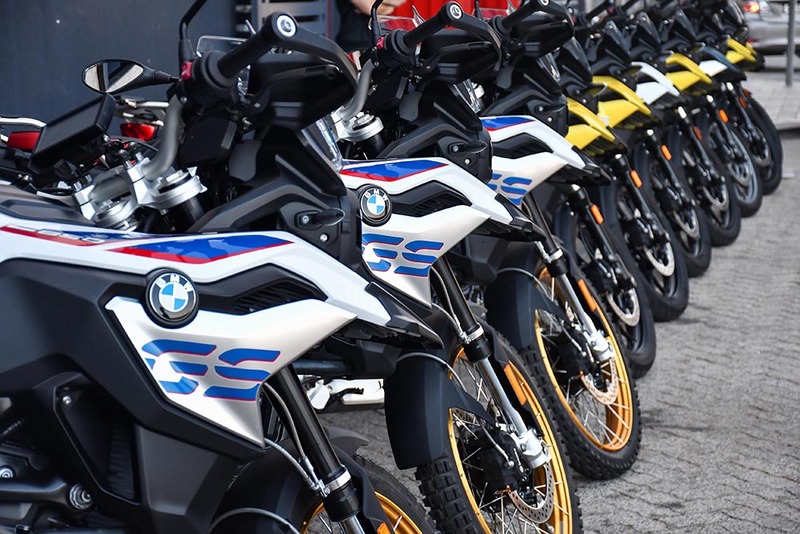 At the conference, Edgar shared statistics about another record year for BMW Motorrad worldwide. 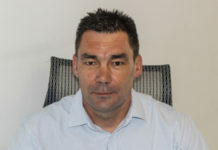 The juggernaut seems to be at full steam, although most would agree that the local market is taking strain. BMW is expecting a lot from this model and the excitement is tangible. After the interactive press discussion, we retired to a well-received dinner on the rooftop, overlooking most of V&A Waterfront. The next morning was my turn to ride the new F 750 GS. Being the more road orientated of the two, it was shod with Michelin Anakee 3 tyres. 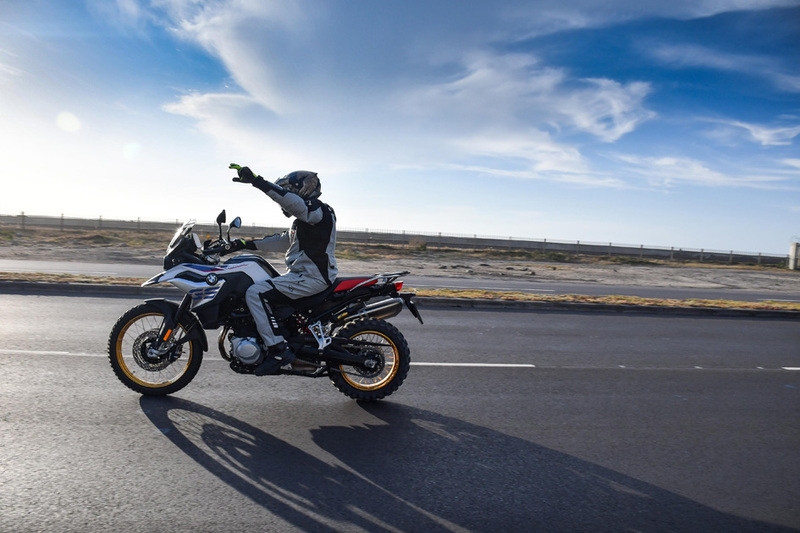 As sibling to the F 850 GS, they share a degree of parts and are always launched together. The second days’ route was laid out to include winding tar sections as well as mountainous gravel roads. 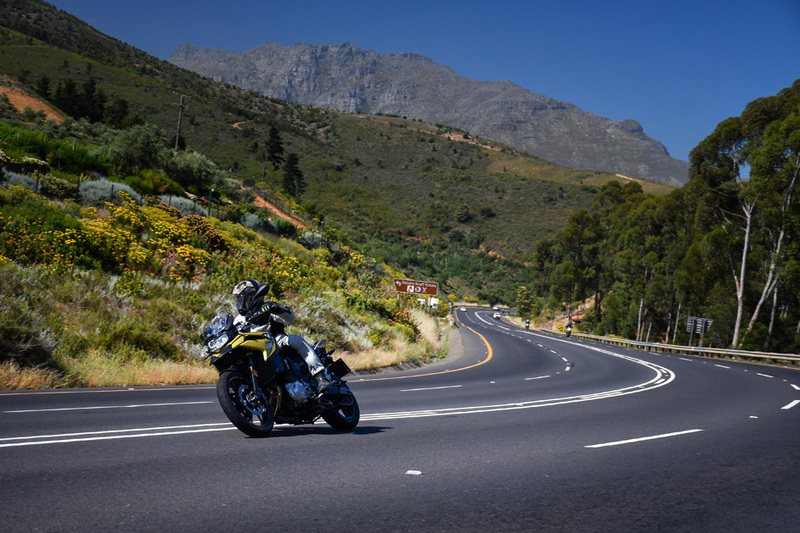 The first highlight on this route was the winding Franschhoek pass where this playful GS came into its own. Carrying the on-board camera for a fellow journalist, I was given the proverbial license to hooligan up and down the pack in the name of “good videography”. I was in my element and so was this youngster of a GS. 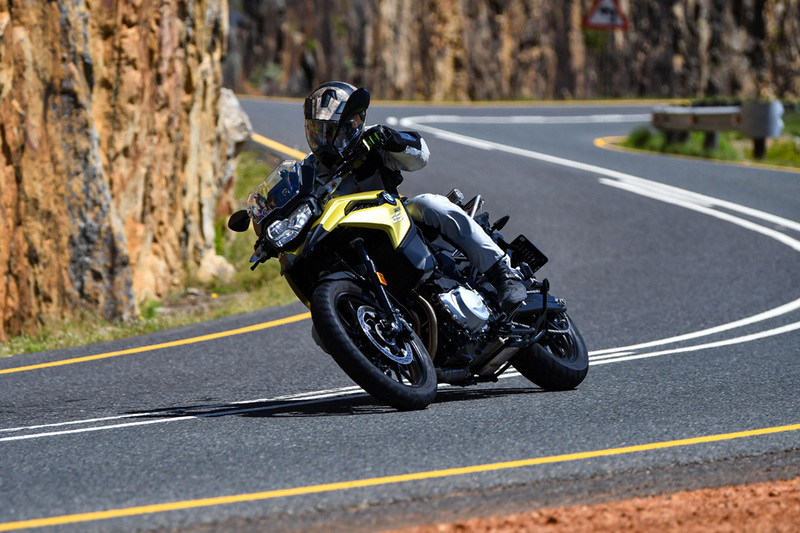 In the days of old, the F 700 GS’s chassis could get “bent out of shape” a bit with hard, committed sports riding. This model is definitely a step up. Composed, predictable handling, the 750 invited me to go harder. Time to hit the dirt, as we gradually make our loop back to Cape Town. This was to be the true test. I found a rough, corrugated piece of gravel with some sand patches to wind the throttle open. Seeing 130 km/h on the speedo, I was expecting the bars to become lively in my hands. 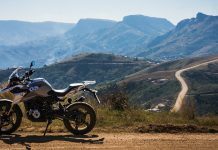 Not to fear, the 750 remained calm and composed and I remember thinking that very few will ever feel the need to take this bike up to these speeds on this kind of gravel surface. It had passed the test I came to give it! Back on tar, towards Betty’s bay, a fellow journalist and I hooked up for a spontaneous top end run. The 750 stayed alongside the 850 he was riding up to an indicated 195 km/h, after which the 850 pulled away slowly. Impressive indeed. Winding along the Old Coastal Road towards Pringle Bay and Rooiels, the tourist in me eventually awoke and I rode at a leisurely pace, absorbing the fresh sea breeze and breathtaking scenery. Our lunch stop was at the Idiom Wine Da Capo Vineyards, high in the mountains behind Gordon’s bay. 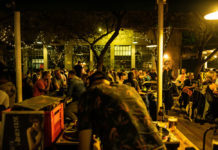 We celebrated a successful event with fine food and good company. Shortly afterwards, the Gauteng based attendants blasted up to Cape Town International for our flight back to the Old Smokey. The aim of the article is not to bore the reader with endless technical details and specifications. We have prepared a press release to piggyback on this article for the more technically minded. Starting with the F 750 GS; few realize that this motorcycle has one of the toughest jobs in the BMW stable. It often has to fit the bill for shorter riders and physically smaller lady riders. These groups demand the same levels of performance as the larger capacity enthusiasts. 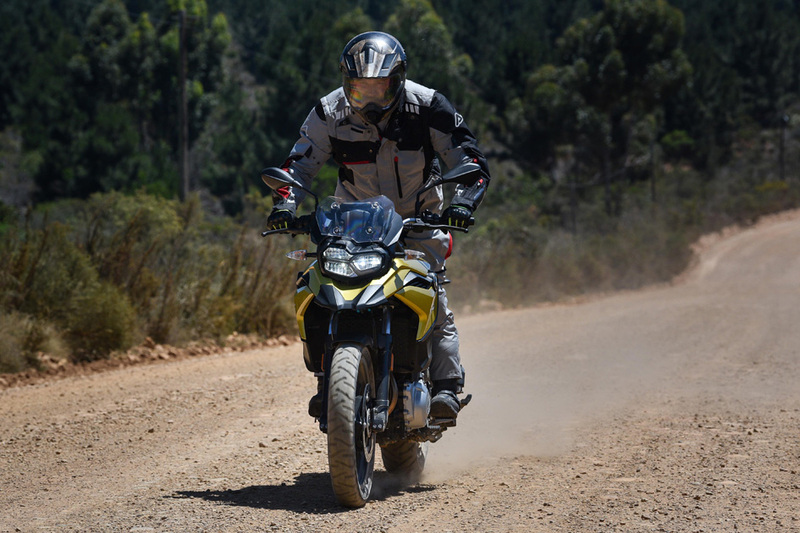 The previous 700 was fairly nervous on unpaved surfaces and required a good amount of effort and skill to navigate. This made life hard for those who had a limited choice as previously mentioned. The new F 750 GS seems to address exactly this aspect. As mentioned before, it is much more composed than the previous model and that can be felt through the calm handlebars. There is also a reassuring steering damper present as standard, although intervention of this part was never required. Seat height and basic seating arrangement feel the same as the outgoing model, so no surprises there. The engine accounts for much more character and low down torque is markedly better. The suspension is certainly of a higher quality and the performance could not be faulted for its intended use. As a road bike with the ability to traverse gravel surfaces in comfort and luxury, this motorcycle is spot on. 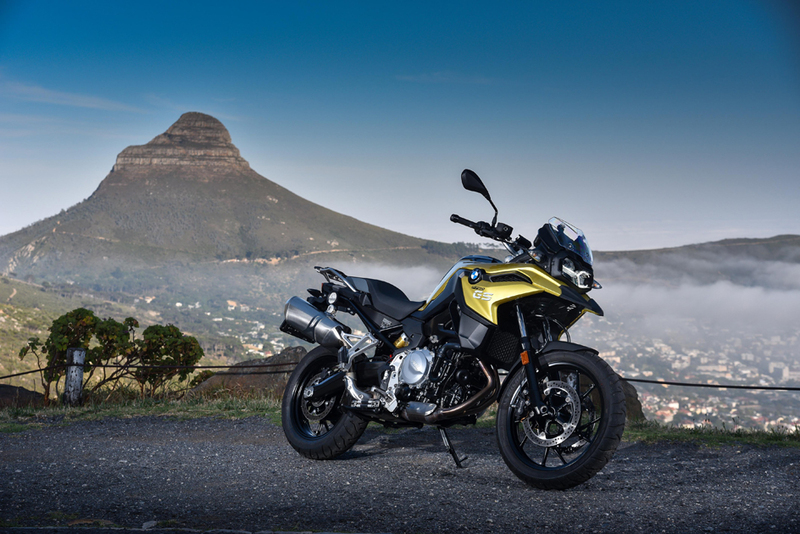 Commuting on the 750 should be effortless, and it would not shy away from long distance touring with decent wind protection fitted. 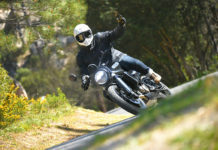 All in all, this spirited performer will do what it was designed for and is an exciting bike to ride. Onto the F 850 GS, and the answer is much more elaborate. The 850 has the job of being what I call an Adventure Sports Bike. In my definition, this means that it will see a lot more action than most larger capacity bikes. 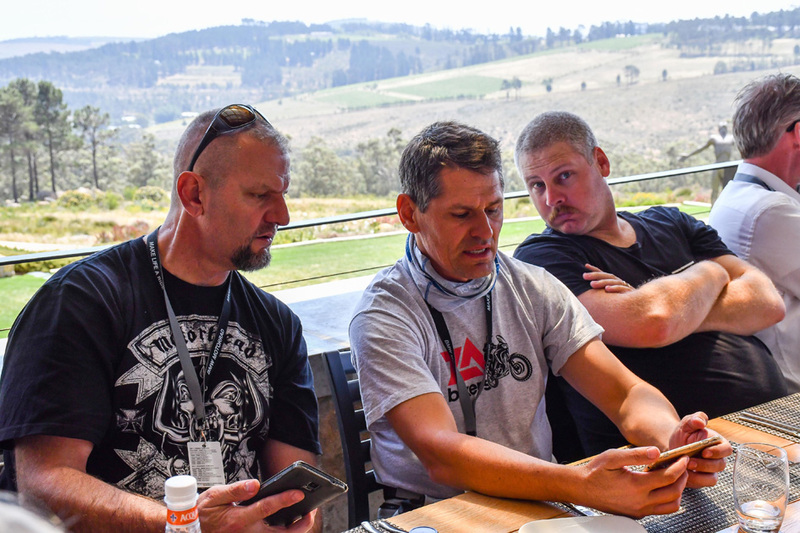 For many a talented rider that cross over from enduro sport into adventure sport, this will be a first stop. It handles the rough stuff as good as any, and has become a true alternative to the larger capacity ultra-marathon contenders. Most of the major complaints have been addressed, in that the new motor has much more character and grunt, with the additional beautiful sounding note. The brakes certainly have more bite. 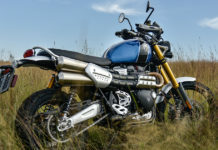 The tyres are now tubeless, and the bike sports most of the same luxuries that are found on BMW’s more premium models. Examples include; cruise control, TFT flat screen interface, shift assist and user defined modes. 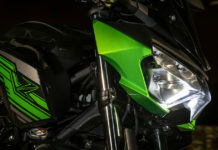 The fuel tank is situated in a more conventional lay-out between the riders legs, which makes the back end look light and skinny. 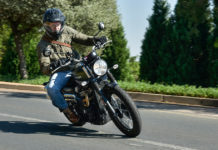 The skinny rear leaves more room for a pillion rider to stand behind the pilot, a grossly overlooked feature on the previous model. In the looks department, the 850 is certainly on a different level and exudes youthful appearance. 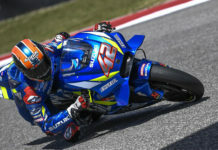 All in all, the middleweight class has a new contender that will certainly make its presence felt. But what excites me the most is that the gap between the big bore bikes and the middle class is shrinking, thanks to the upgrades found on this new arrival. 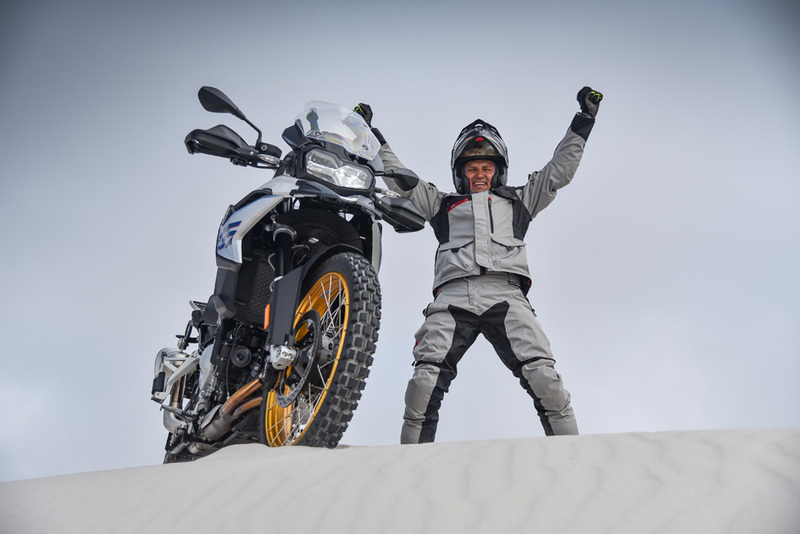 While Braam was faffing around in the dunes on the F 850 GS, I was shooting around the Cape Peninsula aboard the F 750 GS. Perfect weather meant horrendous traffic—but the 750 was still the perfect scoot for urban and spirited coastal road riding, thanks to its punchy motor and nimble chassis. The next day, I swapped over to the eight-fiddy for a longer route, that included highways, mountain passes and stretches of dirt. The mid-sized ‘travel enduro’ blew me away with how versatile it is. Even with the slightly vague on-road feel of the Continental TKC80’s, the F 850 GS railed corners with minimal effort. I’m a huge fan of taller adventure bikes for their commanding riding positions, and the 850’s ergonomics are spot on. Power delivery is crisp, and the optional quick shifters our test units were fitted with only added to the fun. (I can’t say the same for the clutch though, which I found to be stiff and notchy). 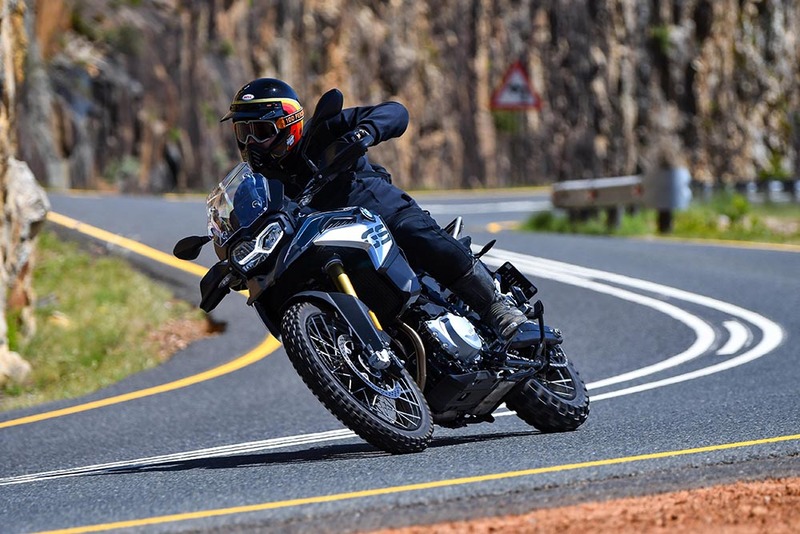 I was a little concerned that the BMW’s redesigned fuel tank would get in the way on the off-road bits, but the bike was surprisingly narrow between my legs. It was also easy to manhandle over rougher, looser terrain. 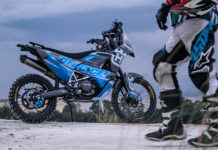 And then there’s the electronics package; the TFT looks good and works well, and the ABS and traction control settings in the ‘Enduro Pro’ riding mode were helpful rather than intrusive. The only downside? I only got to spend a day on it. 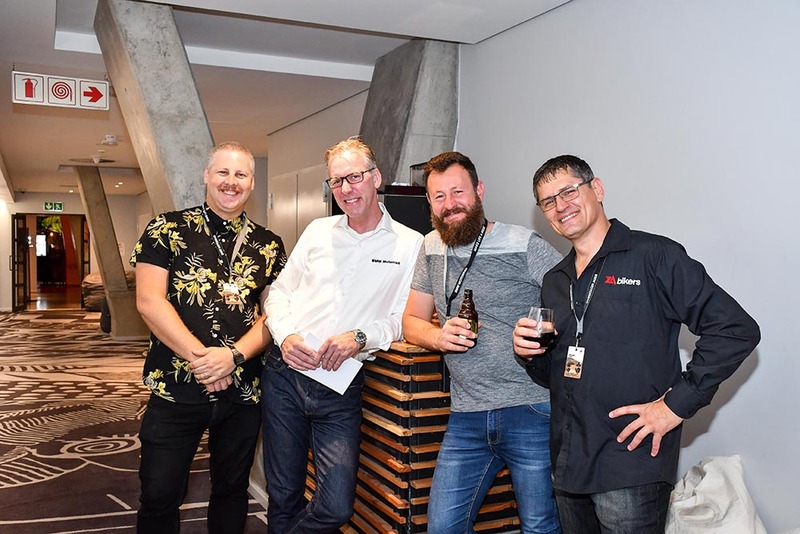 Previous articleGRAND OPENING – LINEX LIFESTYLE CENTRE (22/11/2018). 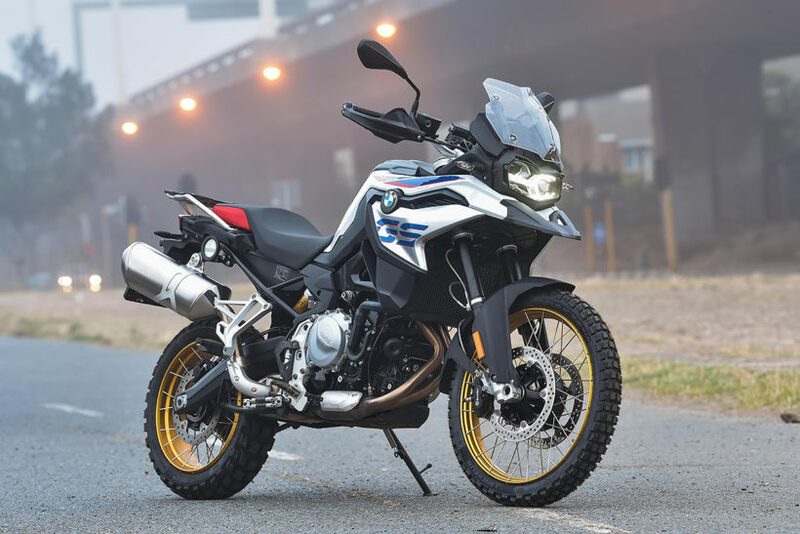 Revisited: Is the BMW G 310 GS a Worthy GS?